So part of the purpose of this blog is to keep track of my progress in painting miniature figures and updating it at least once a week. Obviously that went a bit on the wayside the past few weeks, but not without reason! While I enjoy painting very much, this is still a hobby for me and work got a bit busy recently to the point where I would wake up, work all day/night, go home and sleep, wake up and repeat. It's finally slowed down so I can get back to working on my Space Wolf army. This does make me curious, how do others deal with "real life" and getting time in for their hobby? Going through college, I didn't really have the time (and money) for a hobby and when I graduated I got a job that finally gave me the income to start up a hobby. Of course the downside there is there's less time in the day now to work on said hobby! I get as much time as I can during the week days and the weekends, but there's always things to take care of around the house then. Still, it's nice to take a moment (if short) to relax and do some painting. Layering attempt on Lukas' claws. I can say I have been progressing slowly and steadily on amassing my Space Wolf army. 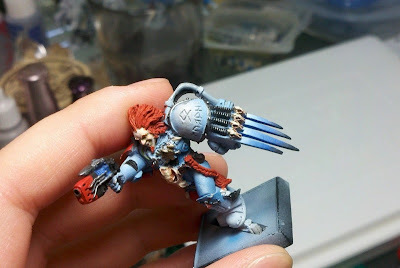 I have to admit by this point I'm just about ready to paint anything else right now after all the blue! ( 6th Edition Dark Vengeance Set, hint hint :P ) Blending has been something that has eluded me and I usually got past that by using my airbrush to get some of the blends I needed. However, I didn't want to solely depend on an airbrush to achieve those blends and I've scoured videos all over Youtube to learn the secret of layering properly. I tried it out on Lukas' claws and I think I managed to get a fairly good blend going from both a light side and a dark side. What do you think? The aim now is to consistently do this on other figures! Before jumping off to work again, I'd like to make a quick little shout out about Black Dog Painting Studio and our special going on with the 6th Edition Dark Vengeance release, you can check out the details here! Its tough to have the motivation to paint an entire army. I never actually finished one because a good competitive tournament army usually consists of ALLOT of models. My 2004 GT Tyranid army (fully painted by someone else) consisted of 103 models and I rarely had a loss in a game but was cheated by the over all GT winner. It was an amazing army but I ended up selling it for $1000. 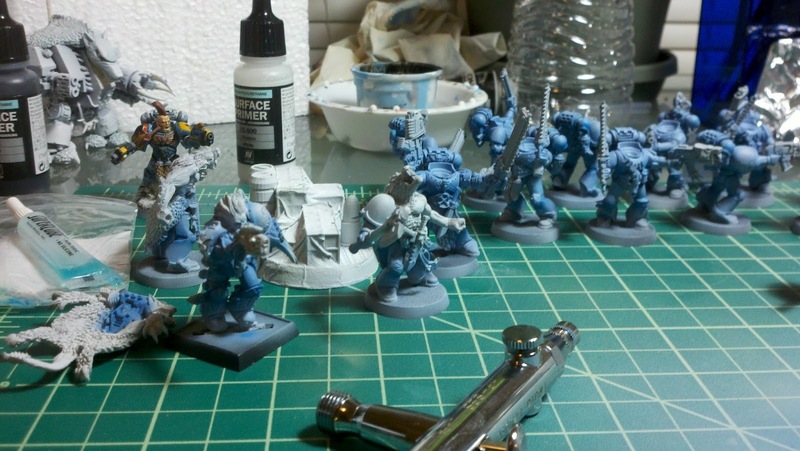 Anyhow you should keep a mini or 2 separate for trying out new colors or techniques or keep one aside that you put more work into for a shot at a golden demon. And if you haven`t got a wet pallet yet you should definitely invest in one. And if you want something new to paint I have 1000`s of minis you could choose from. I have the limited edition emperors champion and wolf priest if you want either of them also. Thanks, James! That's unfortunate about the tourney, sounds like you had an awesome army to play with. I've still only played one game so far, haha. I will definitely pick out a few minis to work with techniques I'm learning, Lukas was my first try at some blending with a brush. I had a makeshift wet palette that I was using earlier, but got myself a nice sized actual wet palette and it is really awesome. Definitely a great investment. I'd love to paint a larger variety of figures! The wolf priest would be really cool to paint, it's hard to find him anywhere to grab.